The Conficker worm has already created new waves in the Web world. Almost everyone is discussing it’s possible effects and methods to nullify it’s effect. In this story we will tell you about a way in which you can check and repair your computer automatically if it has any traces of the dreaded Conficker worm. 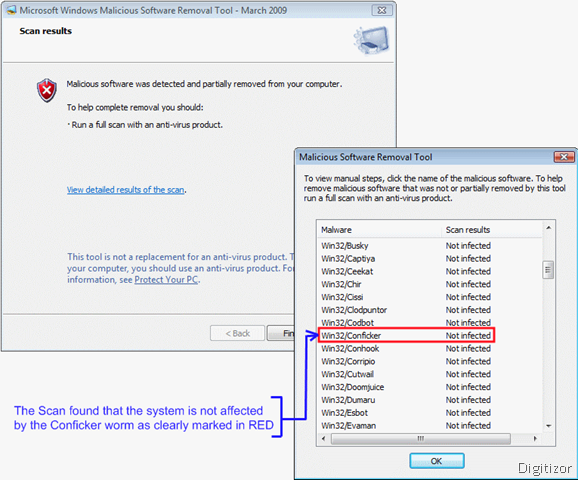 The Microsoft Windows Malicious Software Removal Tool checks computers running Windows Vista, Windows XP, Windows 2000, and Windows Server 2003 for infections by the Conficker worm and also by other specific, prevalent malicious software. The scan this tool runs is generally a in-depth one, so it takes quite a lot of time if you have large capacity hard drives. If it finds any infection, the tool helps remove them. After the detection process is complete, a report is generated which shows you a list of common worms and infections and whether you were affected by it. 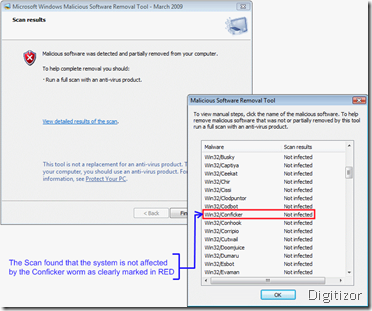 This tool will almost repair any infection and in case it is unable, it will as you to run a antivirus check. You can download the latest version of this tool from Microsoft Download Centre. You also might like to read our other articles about this Conficker worm.